Recently, I was thinking about how to improve the handling of racing copters. I noticed since quite a long time, that different copters behave quite differently in fast turns: Some drift quite a lot (especially when they carry a larger battery or an action cam), others drift less. I was always preferring copters that drift as little as possible. That is also why I am trying to reduce the weight of my copters as much as feasible. 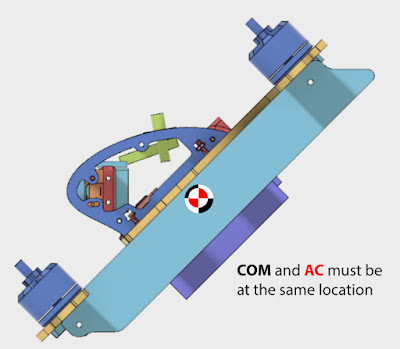 The amount of drift depends on the weight of the copter and the lift and drag of the fuselage for sideways air streams (side-slip). The larger the lift and drag, the more side force the fuselage produces at a given side slip angle. More weight = more drift, more side force = less drift. 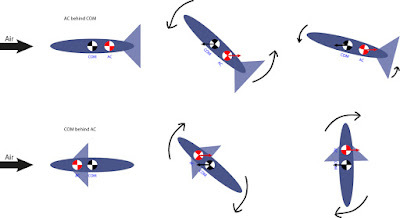 If there is only very little side force available from the copter, then you have to point the nose of the copter towards the centre of the turn ('drift') to keep the desired trajectory. This is ok and fun most of the time. But on some tracks with a lot of fast and quick turns, you will drift so much that you will be really busy with pointing the nose towards the centre of the turn. Drift vs. grip. 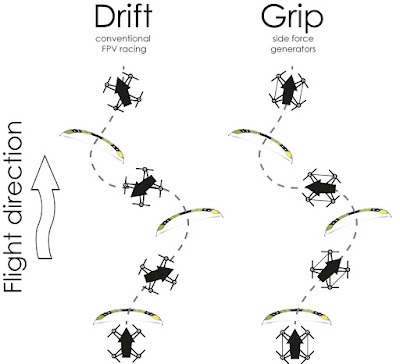 Drift: the nose of the copter always has to point towards the centre of the turn to keep the desired trajectory. Grip: The copter mostly follows the direction of the nose, it doesn't slip sideways. 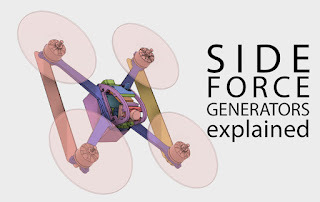 Side note: The name 'side force generators' (SFGs) is taken from RC aircraft: SFGs are winglet-like structures at the wing tips of aerobatic RC aircraft. They are used to enhance the performance in 3D flight by enhancing the effect of the rudder. 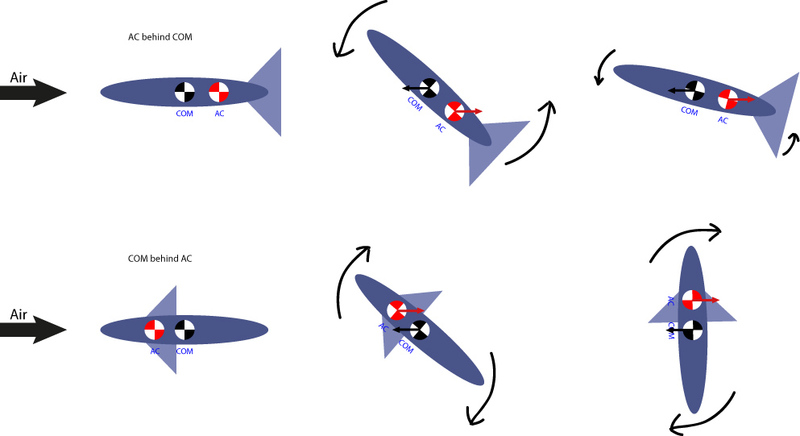 Manoeuvers that require an effective rudder (e.g. knife edge flight) highly benefit from these devices. 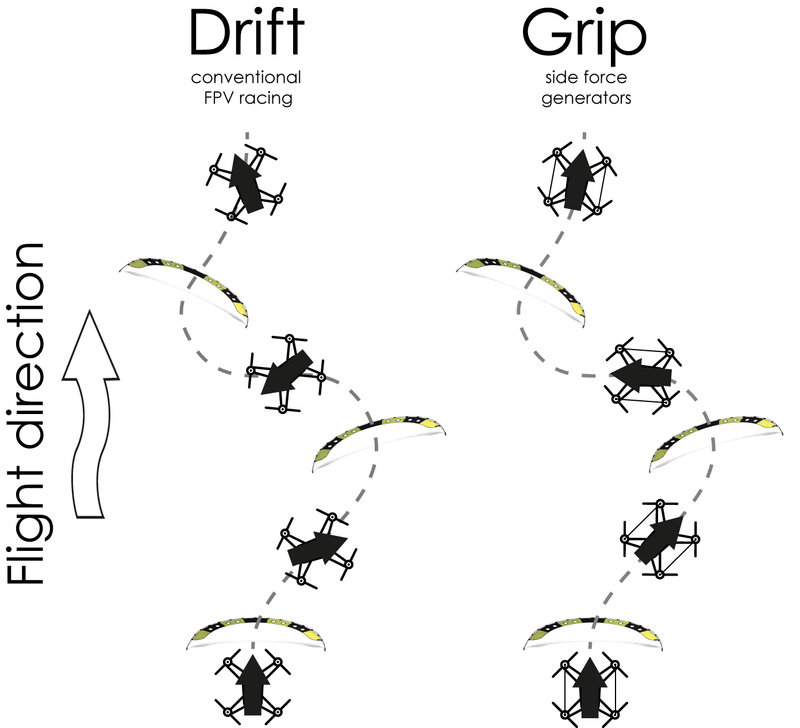 To reduce the amount of drift during turns, you can increase the side force of your copter by enlarging the area in sideview. The people from RedBull Dr.one increased the sideview area quite dramatically (thanks, Heiko Schenk, for the image) but pilots experienced huge problems with it. The large area creates huge amounts of torque around all axes when it is not perfectly aligned with the flow (and perfect alignment will never ever happen). Then, the motors will be extremely busy to fight this torque. In the end, the RedBull fin had to be removed, because it was unflyable (well, not really a big surprise). The problem with the above fin is that the aerodynamic centre of the fin is far away from the centre of mass. Flying objects become unstable when the aerodynamic centre is in front of the centre of mass (see picture below). However, they become stable, when the aerodynamic centre is behind the centre of mass. This is the case for fixed wing airplanes. 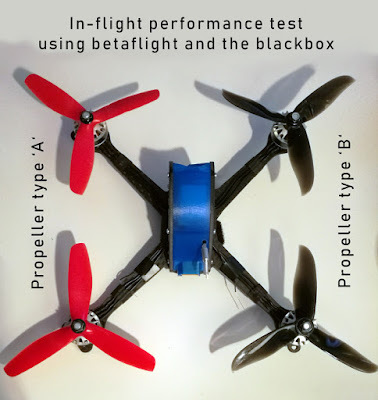 For multirotors, it is best when aerodynamic centre and centre of mass are in the same position, otherwise you will lose maneuverability. There are probably many solutions to enlarge the area in sideview of a copter and keep the aerodynamic centre at the same position as the centre of mass. Here is my solution: I measured the position of the centre of mass on my copter, an then designed a simple shape with the aerodynamic centre at the correct position. I was calculationg the aerodynamic centre with the copter inclined at 45 degrees (because that is the inclination it might have on average on a racetrack). The aerodynamic centre was calculated for 45 degrees inclination. Ideally, you would calculate the aerodynamic centre of the whole copter (including the area of the frame, lipo battery, motors etc.). But I think it is ok for now to ignore the other areas (assuming that the quad was flying ok without SFGs before). I am also ignoring the effect of the propeller jet and many more aerodynamic interactions for now. SFGs will only work if the aerodynamic centre coincides with the centre of mass. For my initial tests, I was using 3D printed airfoils. Later, I was using 1 mm thick carbon plates as wings. When the copter flies straight, the SFGs do not add much area and will not increase drag too much. 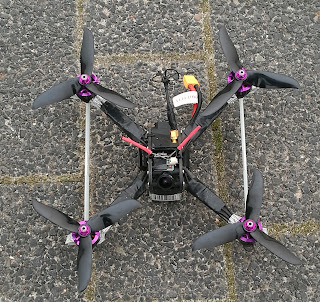 After waiting a long time for some minutes without rain, I could finally do some test flight today. I like the results. The copter drifts much less, that makes fast flying easier. As long as some throttle is applied, you will not notice any negative side effects of the SFGs. But, when you fly at full speed, then completely cut the throttle, and then apply 90° yaw, then you will hear that some motors are spinning up a little bit to compensate the aerodynamic moments. But the copter does not do any unwanted movements (if PIDs and especially the 'I' are tuned correctly). Although I have a serious lack of flying practice, I did some side-by-side comparsion on a small racetrack. With SFGs, I am almost a second faster. And also the standard deviation (how much does the lap time vary) is much lower - I think because I do less pilot errors, because it is easier to fly. Fastest lap is lmost the same. BUT: On the setup without SFGs, I was skipping one gate (because of bad lighting conditions that my old CMOS cam couldn't handle). Without skipping the gate, the lap times would be worse for the setup without SFGs. How about trying it yourself? You can experiment with the shape of the blades easily by 3D printing different types of 2D blades. Although wind seems to be the enemy! What would you suggest to get the PID tune better? As it flies great in call conditions so hard to tune for! The video above was taken while we had a storm here in Germany. I didn't notice any wind sensitivity difference by adding SFGs. But you might need to adjust your PIDs, maybe increase Yaw P and I. Do you have pictures of your fins? 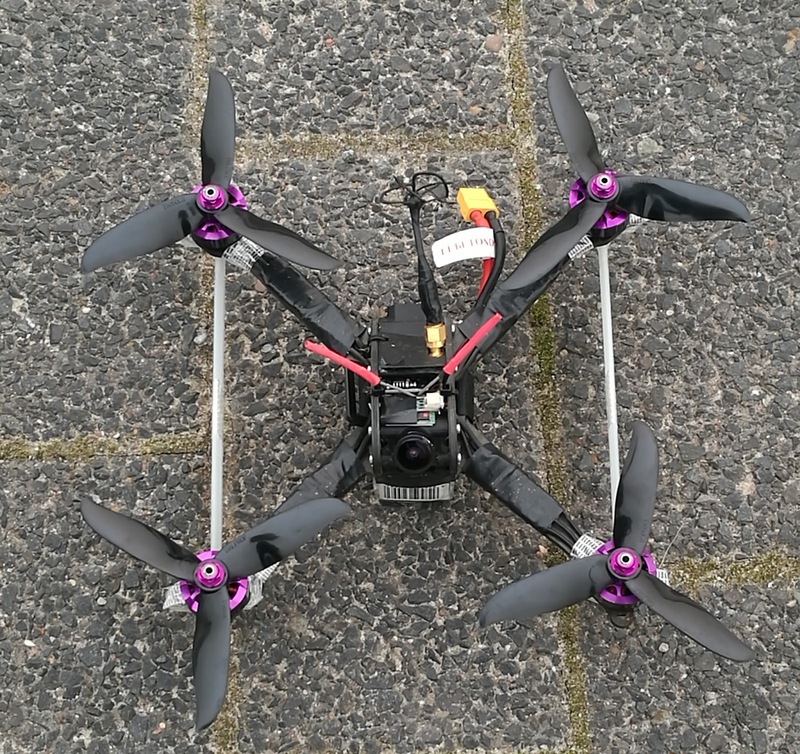 I have tried to put SFGs on my quad. Handling is much better, less drift, more precise. Very good for racing. But the issue is as you mentioned. It's wobble when you cut throttle and make a turn. I'm not sure if I make a hole in the SFGs for air flow side way would help. By the way I love the SFGs and will not fly without it. Hi, maybe you need to tune the position of your SFGs a bit. My quad doesn't wobble, I can only hear the motors fighting it, but I can't see anything in the video image. You might also reduce the size of them a bit. Or put the largest area of them closer to the CG. I will post an update soon with some more thoughts. The wobble happen only when I make a hard turn with high speed. I have to adjust how I punch throttle to make it flies as smooth as possible. It wobbled when I made hard right turns. Other lap that I made a turn with slower speed, there's no wobble. Overall result of the SFGs, I'm so satisfied. Don't want to fly without them anymore. It's funny because the thinking is quite similar to the one for spoilers in F1 car racing... So the ideal frame should be H rather than X according to your idea. Interesting. Why then not putting a fin in the middle that extend the battery area ? Better weight optimization than 2, and in the center of mass anyway. Yes, H frames make more sense from this point of view. Putting the fin below the battery is not a very good idea IMHO. It is not in the CG then (my CG is directly below the motors),and there is only a very low flow velocity. Hi ! I did not mean below the battery, but in the same plane than the battery. 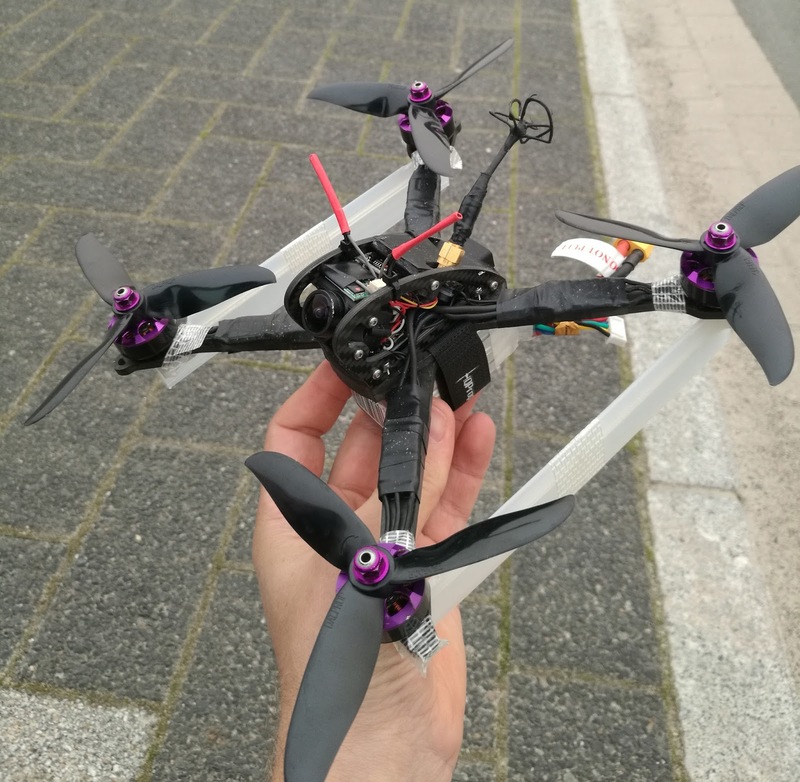 It would be in the same vertical position than your 2 fins, but just 2 smaller pieces, 1 in front of the battery and another behind, extending the battery area in a way => less weight ! This blog is sensational about air mini-drone . We know the drone is useful for taking news, capture, detective etc. But Air mini-drone is more popular for its uses. This drone is flying in the sky and take the rear picture, do many risky tasks what is difficult for man but this drone does it. How do you determine where the aerodynamic center of a quad is? I have a quad and would like to try these SFGs but have no idea where to position it. Or would just putting 2 vertical pieces like what you have be enough?